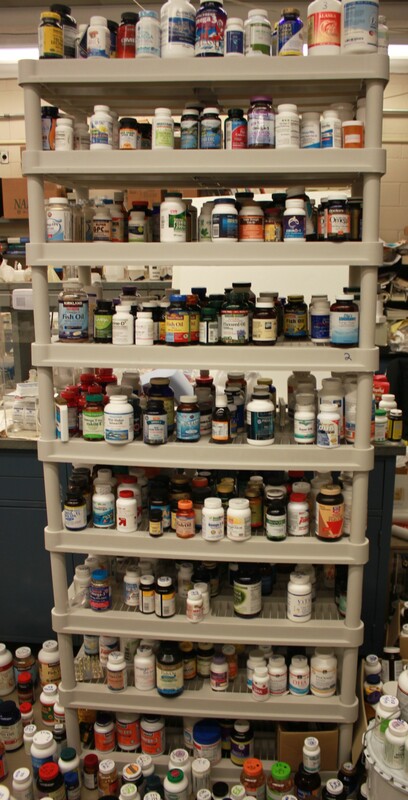 The United States is the world’s cesspool of dietary supplements. Products from around the world are dumped onto the US marketplace because in the US, dietary supplements are assumed safe until proven unsafe. Many products on the market. Disclaimer: This is not an endorsement or condemnation of any products. Mention of any products on this site does not associate a product with being “snake oil”. 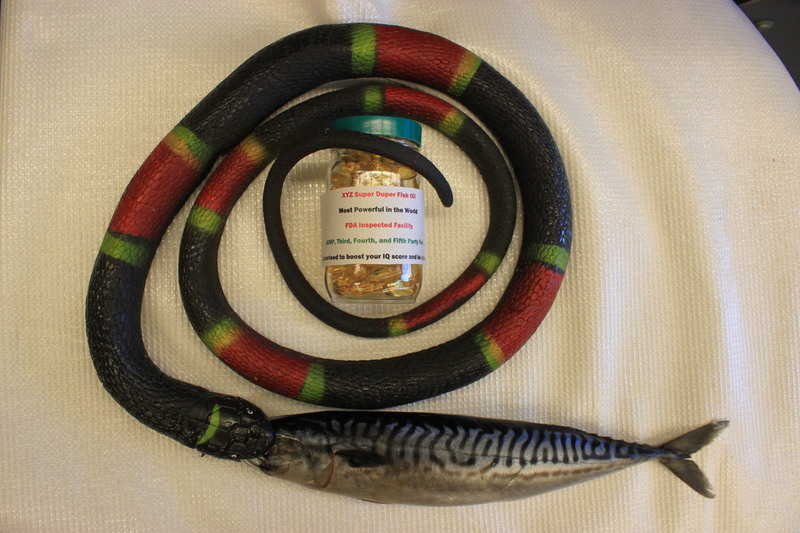 I did not receive any money from any fish oil manufacturers or pharmaceutical companies. All products (~1,900) were purchased with out-of-pocket funds. I did not sign any non disclosure agreements (NDA) with any company. I am a concerned consumer who is concerned with separating scientific fact from marketing fiction about fish oils and other dietary supplements. Before taking any fish oils or other dietary supplements, you should consult your health care practitioner. In addition, to reduce your risk of cardiovascular disease requires lifestyle modifications that include diet, exercise, reduction of alcohol, and reduction of tobacco use. This site is for educational purposes only and is not intended to treat, cure, prevent, or diagnose any diseases or medical issues. These are my own opinions and views. Many products sold on E-Bay. We found that several products sold on E-bay and Amazon may be obtained from a bulk supplier then the retailer transfers the content from the bulk to small bottles and sells them. 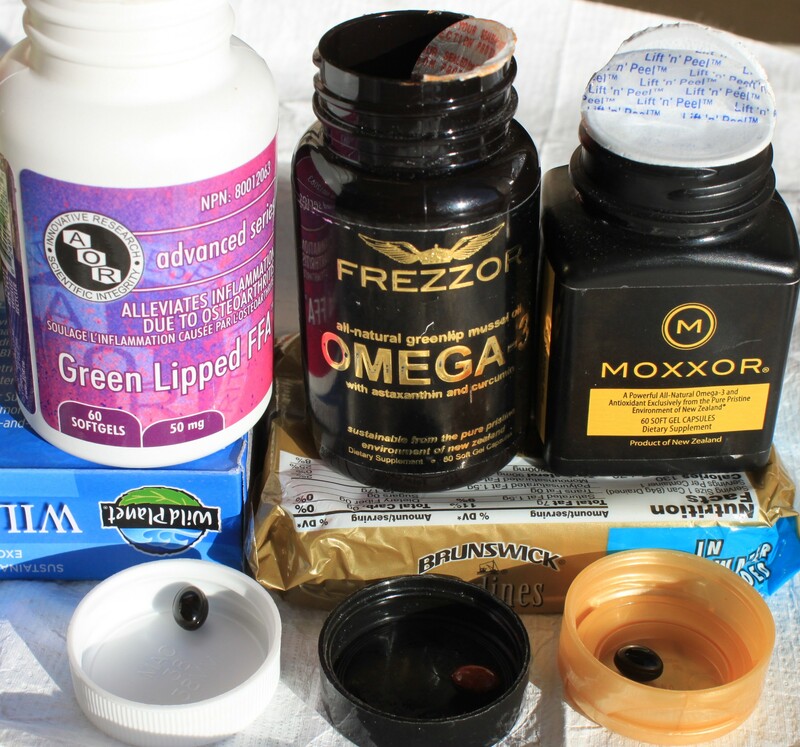 This is not illegal but many of these products violate the DSHEA and they are not “fish oil” dietary supplements. 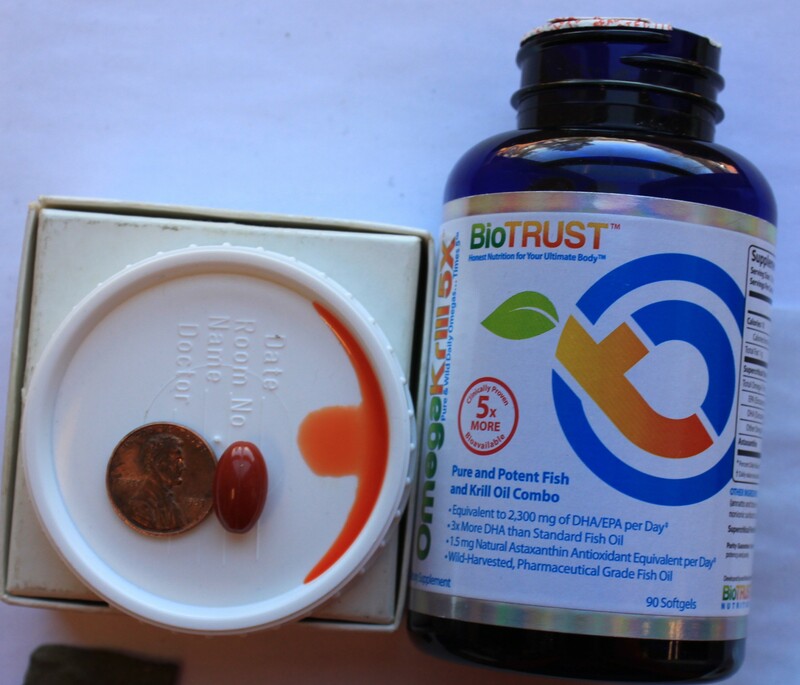 Imagine all those consumers who purchased what they thought was fish oil but got capsules filled with marine biodiesel. Some of these products also are being sold on Amazon with rave reviews about products that are not “fish oil” and are being sold as “Prenatal DHA” . If they only knew what they were really taking. Collection of omega-3 fatty acid sourced dietary supplements. Here is a nice experiment for your middle school student. You can go to the local Walmart, K-Mart, Walgreens, Pathmark, etc. and purchase some inexpensive fish oil. Then, get some blue Styrofoam, in the above case, I purchased farm raised salmon from Costco. 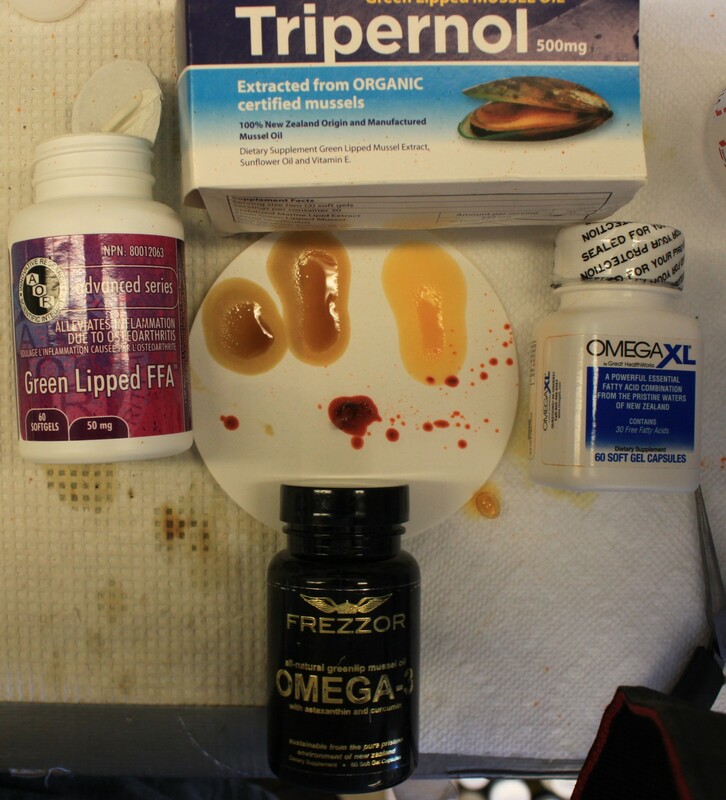 See the piece of salmon to right to demonstrate that real fish oil (fat) does not dissolve polystyrene. 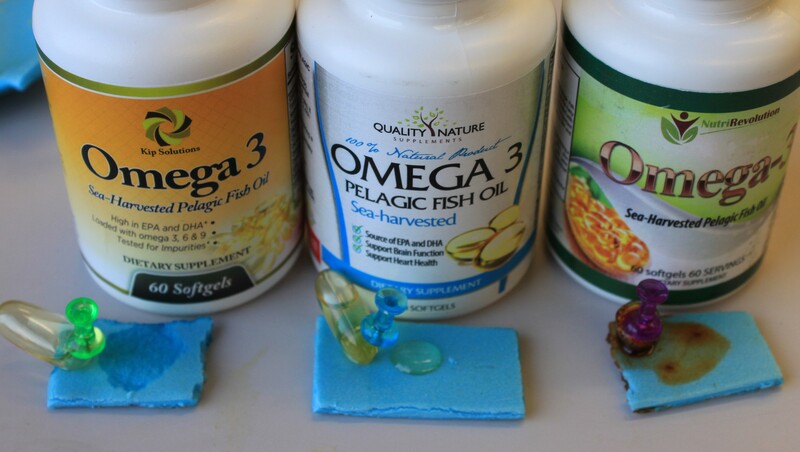 If the polystyrene dissolves, your mislabeled “fish oil” dietary supplement is not fish oil. Be sure you supervise this experiment and best to use gloves and goggles because the ethyl esters will leave a gooey mess. Also, do not drop the capsule (ethyl ester form dietary supplement) on carpet or hardwood floors and step on them with rubber sole shoes. I did this in the lab and discovered that my shoes were being eaten and left black marks all over the lab floor. 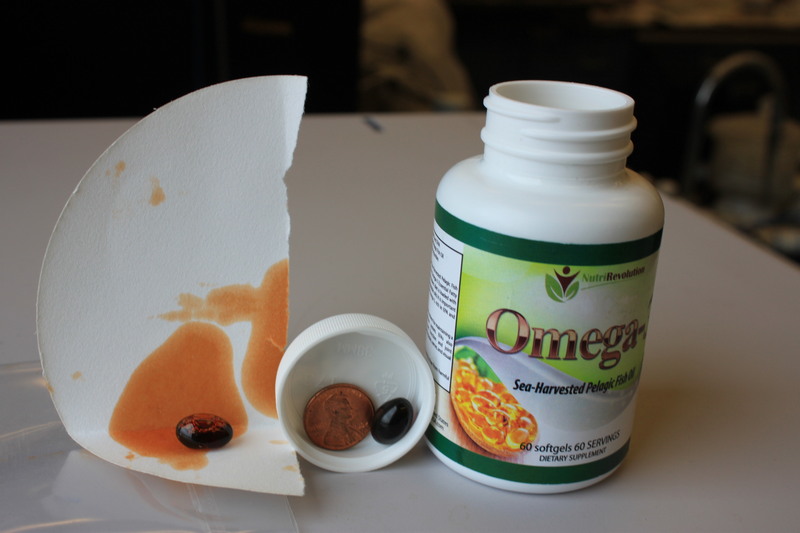 Another discovery was that the liquid (not fish oil) in my enteric coated OmegaVia capsule ate through the polystyrene petri dish as shown below. It left a gooey mess on my instrument. Imagine what an enteric coated capsule contents will do to the gut lumen and perhaps disrupt the tight junction. When taking omega-3 acid ethyl ester fish oils, did you notice any unusual unexplained health issues or side effects? 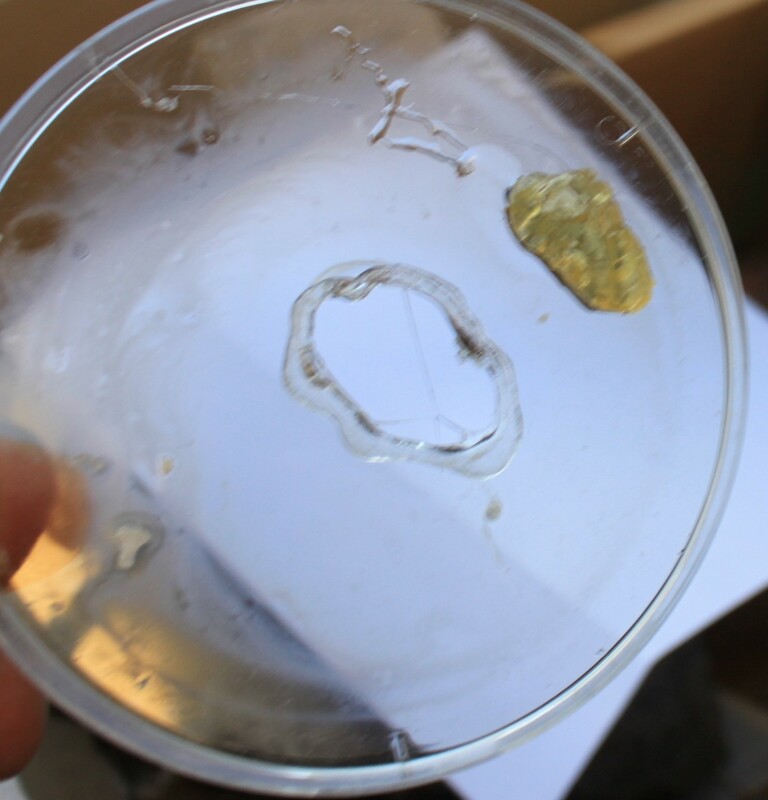 OmegaVia liquid dissolved my petri dish. Greetings and I want to share with you some exciting research that we have uncovered when researching all the different products on the market that supply the two major bioactive molecules (“active moiety”), EPA and DHA. In addition, I wanted to let you know that many nutraceutical products (see photo above) on the market fail to comply with the Dietary Supplement Health and Education Act (DSHEA) of 1994. Many violations of current Good Manufacturing Practices (cGMP) as mandated by DSHEA as explained in 21 CFR 111. As a result, your consumer rights are violated. 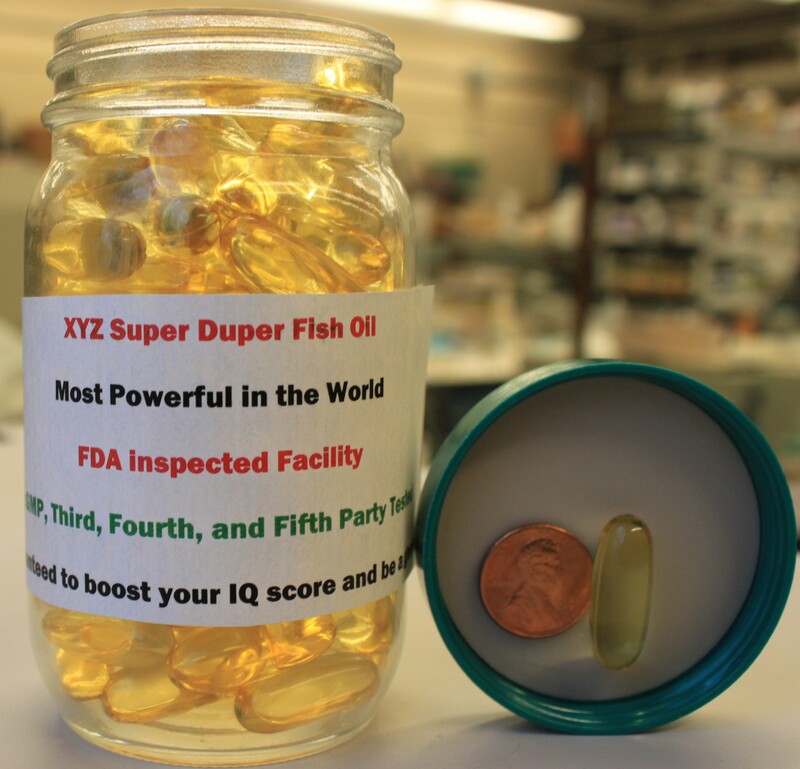 The FDA has a lack of resources to enforce the law, so it is up to the consumer to discover which omega-3 fatty acid sourced dietary supplements are breaking the law and which supplements are in compliance. I will be posting a list of products that are not in compliance of DSHEA and perhaps we as consumers can put pressure on the various companies by not purchasing their product because they are breaking the law. Burden of proof that a dietary supplement is safe and ethical and worthy of consumer purchase should be on the manufacturer or distributor. This should be priority one and not profits. Wow, help is on the way for the consumer. Soon, all those false and deceptive adds for omega-3 fatty acid derivatives, krill oil, fish oil, “pharmaceutical grade fish oil”, “100 % Natural”, and mislabeled products will be disappearing from your favorite online retailers and your local stores where you purchase dietary supplements. I hope the action is like the NY AG to get products that take your money for nothing in return especially those products for what’s on the label does not match the contents of the bottle or capsules. Result in consumer deception, when, for example, manufacturers do not verify the identity of their raw materials. To get started, visit: http://www.fda.gov/regulatoryinformation/legislation/federalfooddrugandcosmeticactfdcact/significantamendmentstothefdcact/ucm148003.htm and especially Chapter 7 that discusses labeling. Wanted: I am looking for old bottles or labels of fish oil dietary supplements that were sold from 1980-1996 in the US. Products such as Walgreens SuperEPA 500 and others. There is some interesting history of these products. If you have any products or labels, please e-mail me at: anchovy@fishoildetective.com. 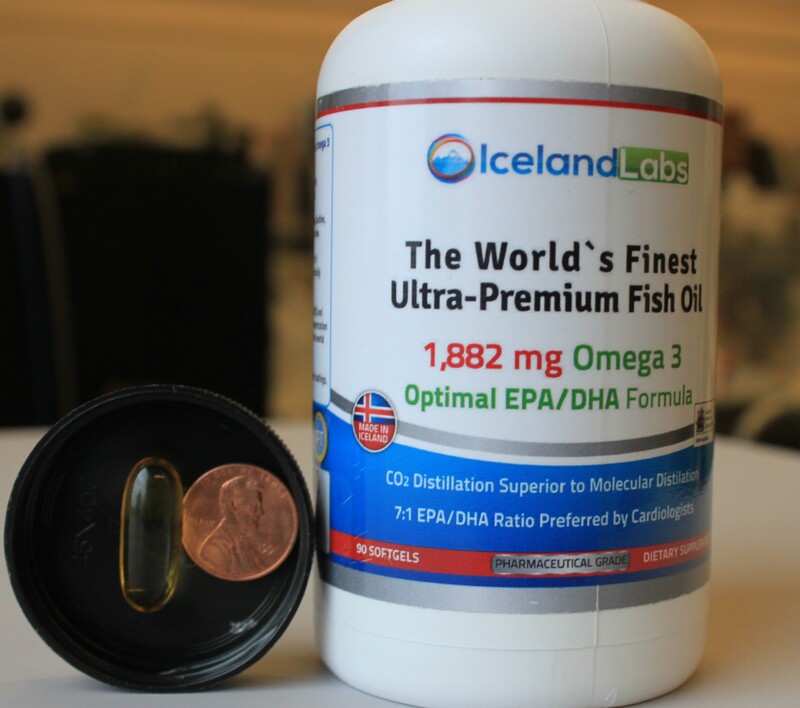 The above is a perfect example of “snake oil.” The product was sold on Amazon and no one challenged the statement “The World’s Finest Ultra-Premium Fish Oil” except us. Or perhaps, no one cares. It turns out that there was no lot number as required by DSHEA cGMP. There was no manufactured or expiration date on this product so that you have no idea how old the contents are. You really need to check the marketing fiction against scientific fact. Amazon lets anyone sell any products and there is no fact checking on the products. 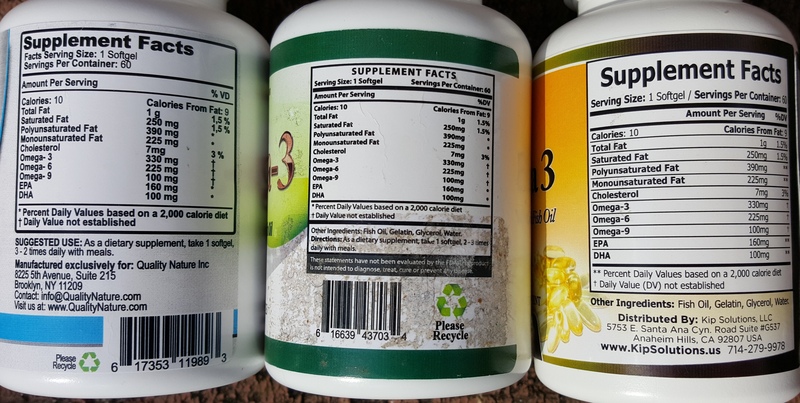 Many dietary supplements sold there do not show the supplement facts labels which is a red flag and I would not purchase a product without having the supplement facts panel. I tried to tell Amazon that the supplement facts were missing and got no response. In addition, typical bait and switch on Amazon. For example, Minami Nutrition MorEPA Platinum was advertised as being TAG product but when my bottle arrived, it was different. I tried to tell Amazon that the photo was incorrect (as of 4-22-2014) but they refused to change it. So, be aware that “bait and switch” is alive and well on Amazon for this product. Most of the time the supplement facts are wrong anyway especially for ethyl esters. Very little Krill Oil in my capsules. Very little Krill oil in this supplement. There is something wrong with my lot # 1401051 and there is no manufacture date on my bottle which is a violation of the DSHEA. Perhaps it fell off during shipping. I am beginning to think that the word “Krill Oil” is being used to sell this product but my capsules have very little Krill oil. Somehow, I feel like I was ripped off by purchasing this product. I paid $49.00 + $6.95 shipping but only got fish oil with a small amount of krill oil. There is only 100 micro grams of astaxanthin per softgel. That is correct, only 1 x 10-6 grams. I believe the high cost of the product is for the VESIorb technology. I contacted the company and they said that it is confidential about how much Krill oil is in the product. Well, I guess so, there is very little. Other companies selling krill oil list the amount of krill oil and phospholipids in their products so that you know what you think you are purchasing. 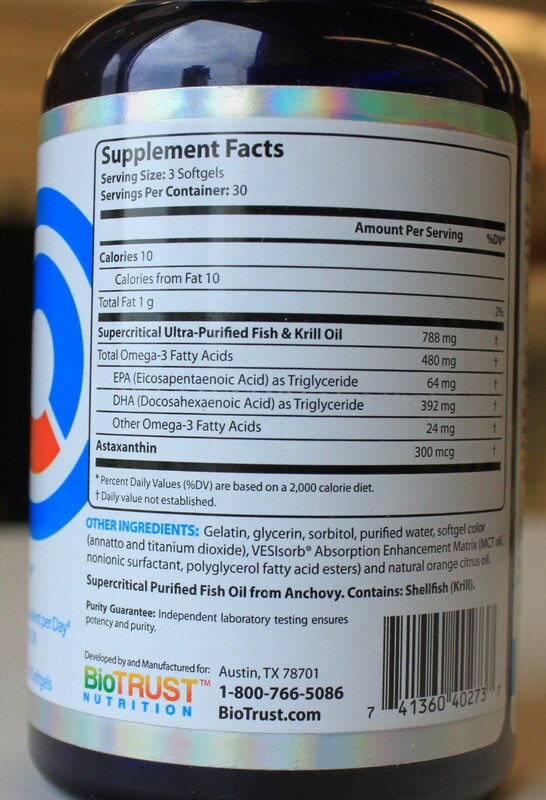 I gather because this is a blend of fish oil and krill oil, they don’t feel it is necessary to inform the consumer how much each component is in the supplement. Also, I believe the product contains polysorbate 80 as the nonionic surfactant. Other products of fish oil using the VESIsorb system state the name of the nonionic surfactant. For example, see the product Ultimate Omega-3 Natural Triglyceride form “600% better absorption” that contains “Omega Choice 3322 TG Omega-3”. Then, I looked up the FDA rules for the use of polysorbate 80 in foods and could not find a listing for use in dietary supplements. Here is a link to the CFR: http://www.accessdata.fda.gov/scripts/cdrh/cfdocs/cfCFR/CFRSearch.cfm?fr=172.840. If it is listed, then the food should list its name and the amount. I guess I will defer to FDA for advice. Stay tuned. Don’t waste your money on this product because it is very expensive and you only get 21 mg EPA and 130 mg DHA per softgel. You are better off buying Kirkland Naturals 180 mg EPA and 120 mg DHA for about $9.00 at Costco for 400 capsules. 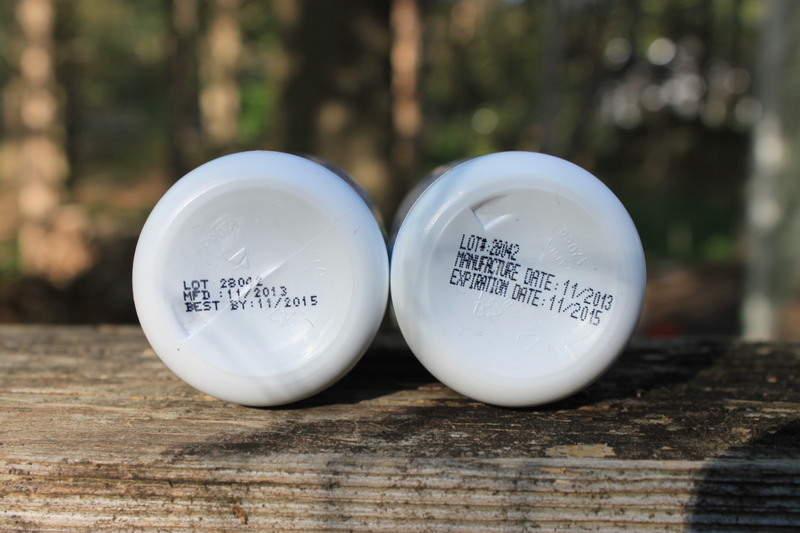 Here is an interesting case of two products with the same identical lot #s and dates of manufacture and expiration. One product OmegaK sells for $67.00 for 60 capsules and Vitegrity sells for $27.97 for 60 capsules on Amazon. 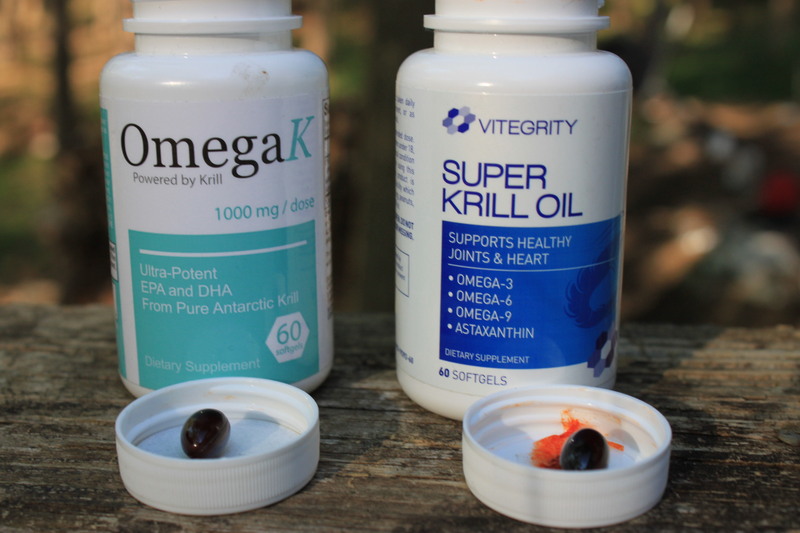 They both claim 500 mg krill oil per softgel but I found very little krill oil in both products when I compared my USP Krill Oil standard to these products. Those who purchased the OmegaK product were ripped off. I guess it must be the marketing cost that causes the product to be more than twice the price of the same identical product. 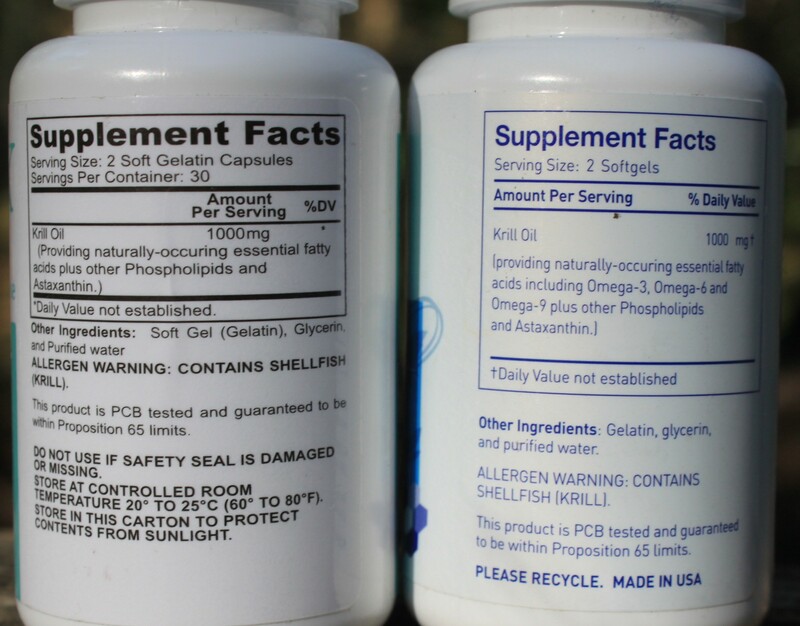 Also, both products do not list the amounts of EPA and DHA bioactives that are being supplied by the 500 mg of the krill oil. Yes, I realize that the amounts do not have to be declared and only the amount of the dietary ingredient, i.e. “krill oil”. You should do due diligence on the labels and be suspect if the labels for krill oil do not list a breakdown of the ingredients such as EPA, DHA, and phospholipids (PL). New products come on the market daily and Amazon is a major storefront. Where is the amount of EPA, DHA, phospholipids? These are red flags for not being krill oil. Is one a counterfeit of the other or are both fake krill oil? Below is another product in which the label contents do not match what is in the bottle (capsule contents). My question, will the real Pelagic Fish Oil please swim forward. 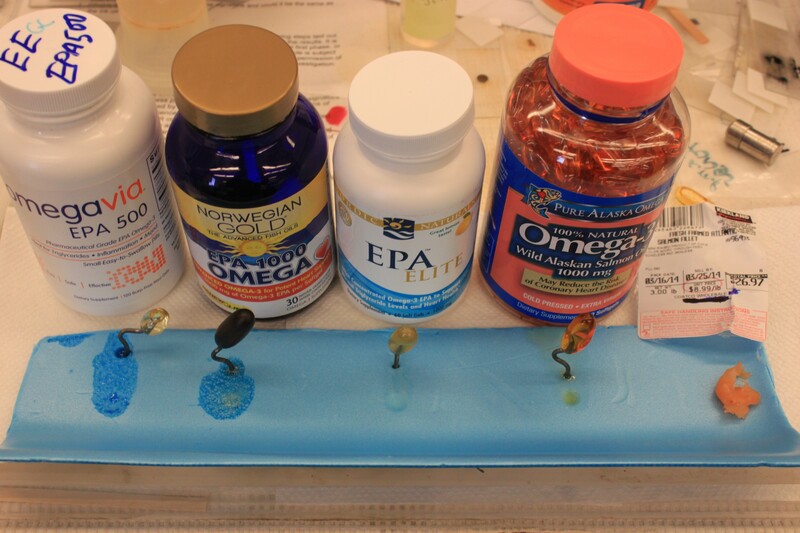 Styrofoam test reveals product Kip is omega-3 fatty acid ethyl esters, which is not fish oil. “As in the case of other food lipids, SPPFBO consists mainly of a mixture of triglycerides of various long chain fatty acids with small amounts of mono and diglycerides. Triglycerides are esters of glycerol and fatty acids with chains of 14 to 22 carbon atoms. The fatty acids that characterize SPPFBO and other fish oil are similar to those in the various edible vegetable oils and animals fats differing principally in their relatively higher proportions of polyunsaturated fatty acids with five and six double bonds.” Therefore, Kip Solutions Omega 3 “Sea-Harvested Pelagic Fish Oil” is not fish oil. The capsules are filled with fatty acid ethyl esters (FAEE) for which about 26% are the ethyl esters of EPA and DHA. 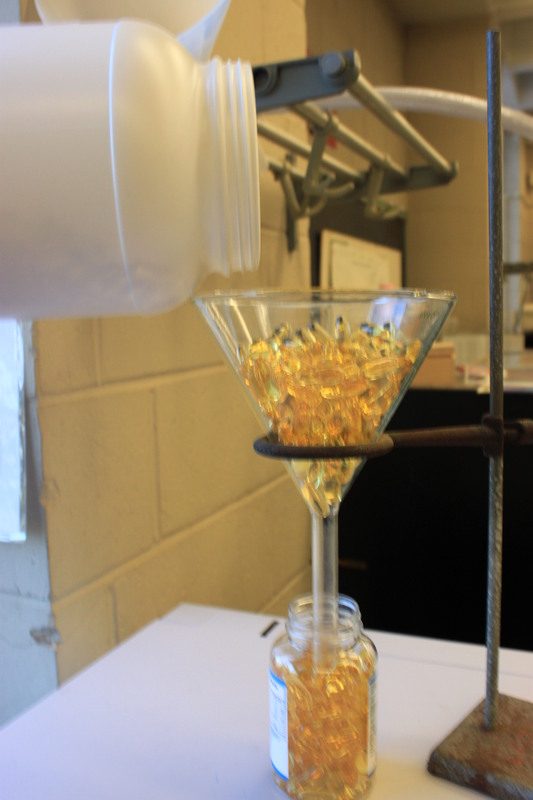 The remaining 74% are fatty acid ethyl esters that are major impurities from the chemical reaction (transesterification) between ethanol and natural fish oil using NaOH as a base catalyst. Do your due diligence and perform a literature search on the topic fatty acid ethyl esters FAEE and see what the autopsy reports have observed. Quality Nature is the only product that is “Pelagic Fish Oil” and NutriRevolution is krill oil. Unfortunately, NurtiRevolution did not reveal allergen shellfish (krill oil) warning that is required by law “Food Allergen Labeling and Consumer Protection Act of 2004’’. Know what is in your dietary supplement. Below is a very nice guide to labels and references to specific parts of DSHEA that amended the Act. This diagram was taken from: http://www.crnusa.org/pdfs/DS-RegsLabel-0613.pdf. 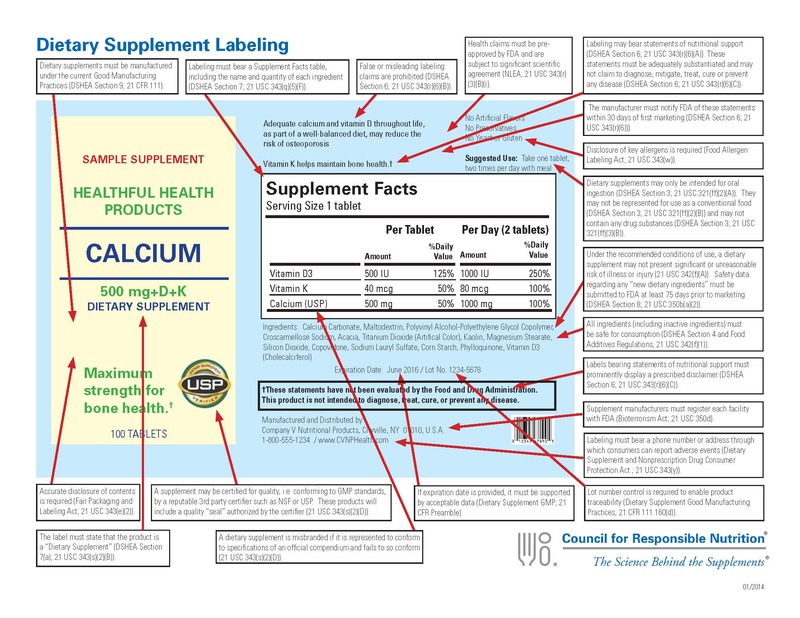 Please study this diagram so that you know your consumer rights if you must use a dietary supplement. Get your nutrients first from your diet. Sardines are great for a snack instead of those potato chips or jellybeans. Disclaimer: We do not condemn or endorse products. We do additional due diligence for another perspective from scientific fact to provide information that may contradict marketing fiction. You the consumer have the final say in purchasing a dietary supplement, hopefully in consultation with your health care provider. It is your body, your money, and finally your choice of what products to purchase. Diet first, exercise, quit smoking, and reduce alcohol consumption since these may reduce your risks for cardiovascular disease (CVD). Most important is to inform your health care professional of any dietary supplements that you plan to take or are taking. Someone boasting of how good Frezzor Black challenged the viewers to investigate the product. So, I did my due diligence and I welcome others to do the same in case I made a mistake. 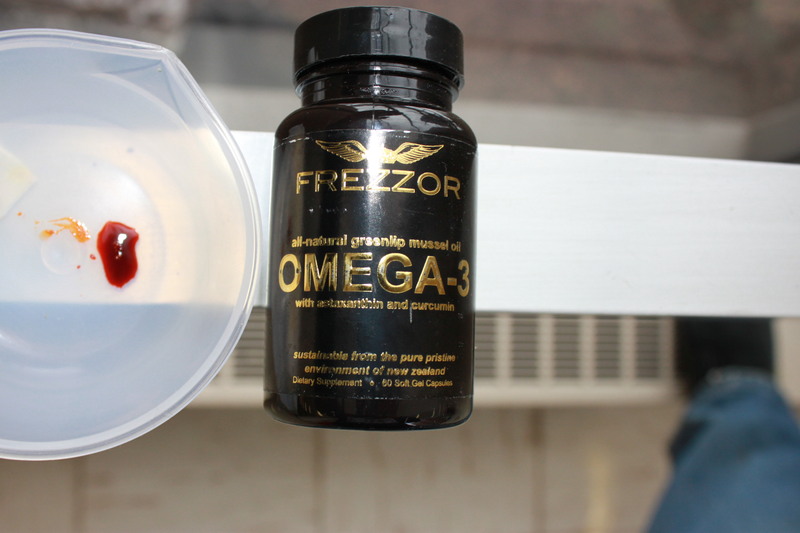 Shown below is the Frezzor dietary supplement product that I purchased on Amazon February 1, 2015 for $69.95, (lot # A4110, Expiration date 1/2017). Notice the mash in the product. My bottle contained capsules that were leaking and thus many capsules were stuck together. I should also warn that you should not open the capsules unless you are wearing gloves. 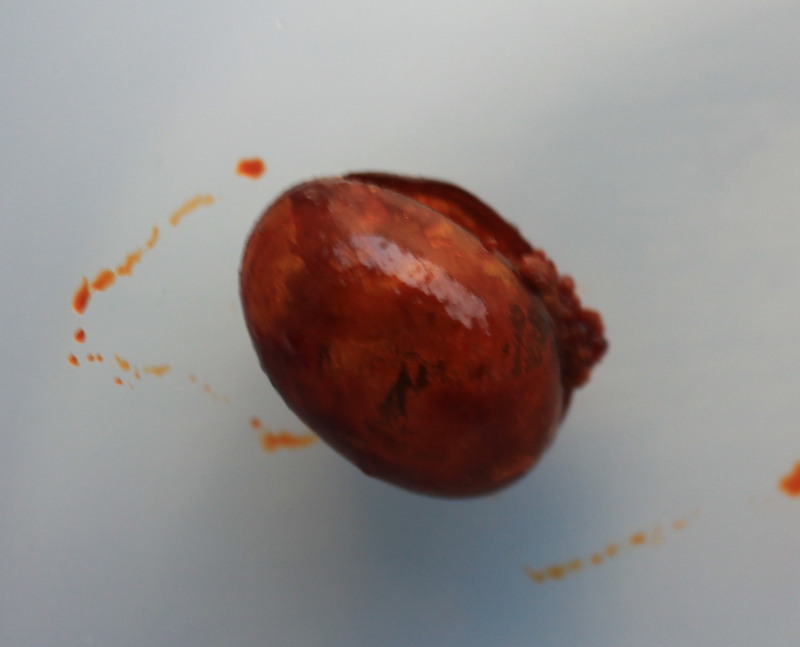 For my lot, the red liquid inside the capsule stained my fingers. 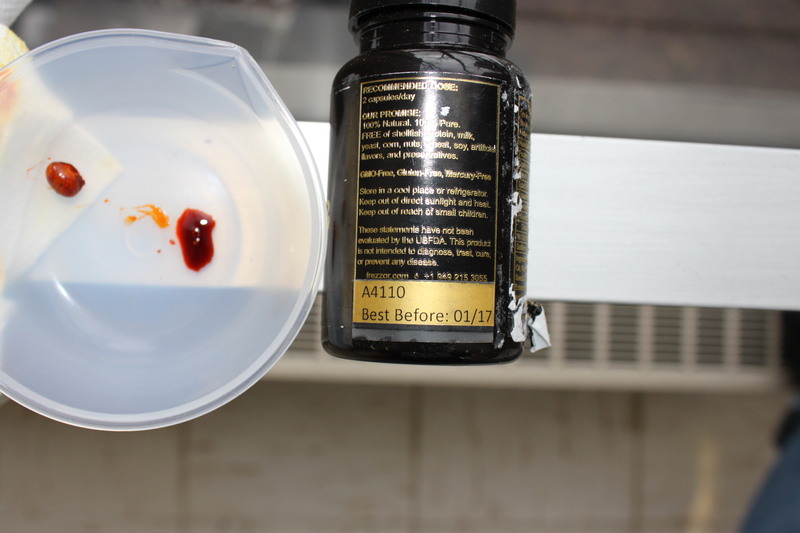 I had to use acetone to remove most of the red colorant while the un-removed colorant wore off over time. Notice that there is a mash in the capsules. Again, notice the mash in the capsule. I wonder what is this mash. Looks like the Kiwi. 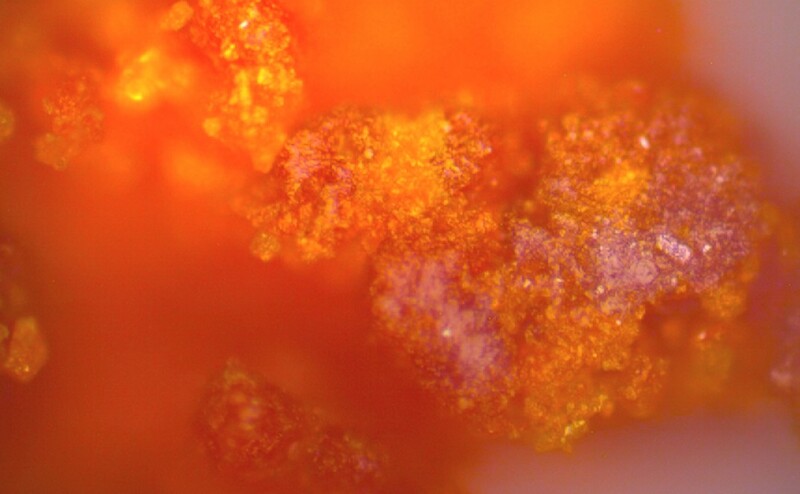 Microscope photo of the mash material contained in the Frezzor capsule. Because Frezzor lists the contents as a “proprietary blend”, they do not have to list the content amounts (mg) of each ingredient. As a result, companies can hide behind this and put any amount or none at all of the ingredients in the dietary supplement. The product lists “81% of Polyunsaturated Fats are Omega3s” this could all come from the flax seed oil that contains the omega-3 fatty acid alpha linolenic acid (ALA) or the Kiwi oil that is reported to contain approximately 53% ALA. 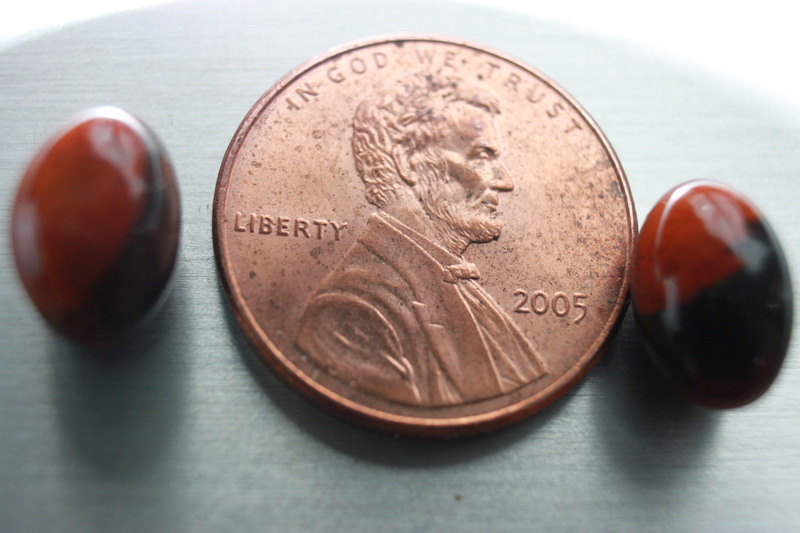 Mean capsule weighs 0.26349 ± 0.00159 g or 263.49 ± 1.59 mg and the liquid weighs 0.14130 g or 141.30 mg. This mass is composed of the nine ingredients listed above. 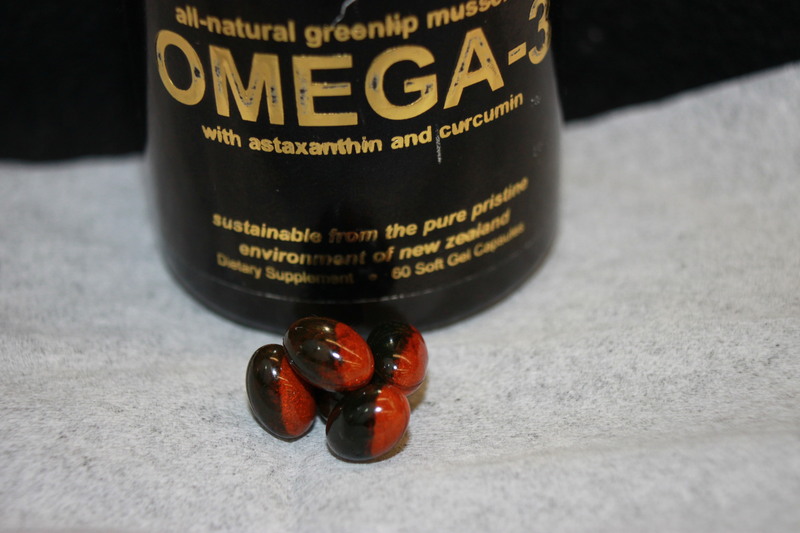 As a comparison, same analysis was performed on OmegaXL and other Green Lipped Mussel products. Look closely and you will not see any mash in the other products. From: Lipid, FA, and Sterol Composition of New Zealand Green Lipped Mussel (Perna canaliculus) and Tasmanian Blue Mussel (Mytilus edulis) Lipids, Vol. 37, no. 6 (2002) from one site in the paper. Values in % of the total lipid content (19.7 mg/g wet weight). 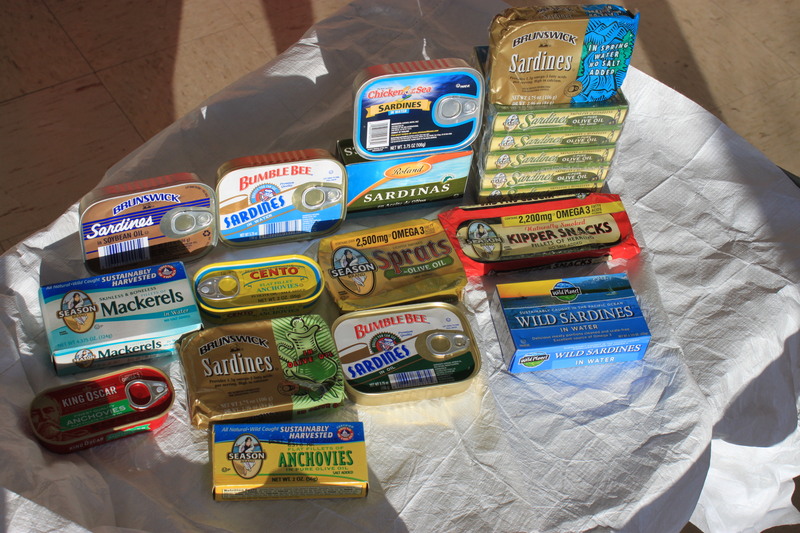 In my opinion, consumers are better off spending their money of some canned sardines, tuna fish, anchovies, or mackeral. One can on sale at our local Shop-Rite costs $0.99 and provides 1,630 – 2,500 mg in EPA and DHA. Compare this to Frezzor that cost $69.95 for 60 capsules that do not list the EPA and DHA contents. 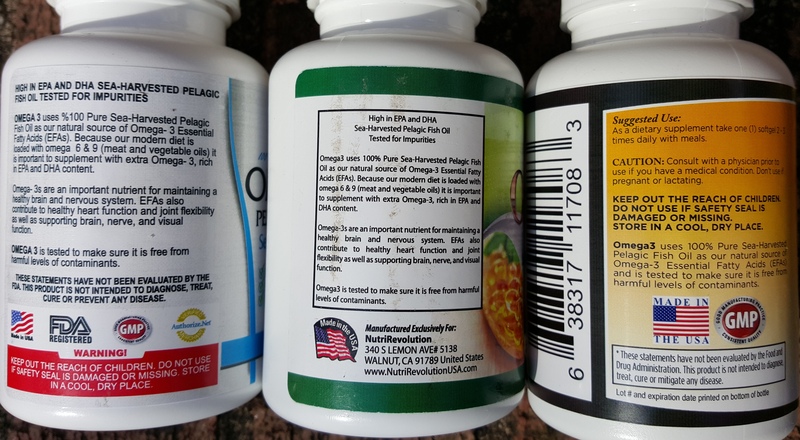 As a guide, ConsumerLabs claimed (reported) 6.3 mg EPA and 4.9 mg DHA in an OmegaXL capsule. Frezzor reminds me of those historical claims of the Snake-Oil salesperson selling “snake oil”. Hopefully Frezzor Omega-3 will prove otherwise. Again, this is my opinion based on the product (lot # A4110, Expiration date 1/2017) I paid $69.95 on Amazon February 1, 2015. Contact: anchovy@fishoildetective.com if I have made any errors.